The Ravens lost their opening game of the 2015 NFL season in Denver. That loss pales in comparison to an injury sustained by one of Baltimore’s most important players, linebacker Terrell Suggs. Terrell Suggs, linebacker for the Baltimore Ravens. Suggs, the emotional leader of the Ravens, tore his left Achilles tendon in the fourth quarter of Baltimore’s 19-13 loss at Denver. He was able to walk off the field under his own power, and was not willing to be carted off to the locker room, but eventually did at the insistence of team doctors. Teammates thought Suggs only had cramps, and were shocked to learn of the official diagnosis after the game. Now, the Ravens are looking for other defensive players, young and veteran alike, to step up and fill the leadership void left behind by Suggs, who previously tore his right Achilles ten- don during spring team activities in 2012. Suggs offered encouragement to his followers on social media after learning his season was over after barely beginning. “Chin up Ravens Nation! We’ve been here before…This changes NOTHING!!! Our mission is still the same,” Suggs said on Twitter after the game. Baltimore will now look to players like linebackers Elvis Dumervil and C.J. Moseley, along with defensive tackle Tim Jernigan, to take on increased roles in leading the Ravens’ traditionally strong defense. They will be called on to replace the team’s career leader in sacks with 106.5, the sixth-most among active players. 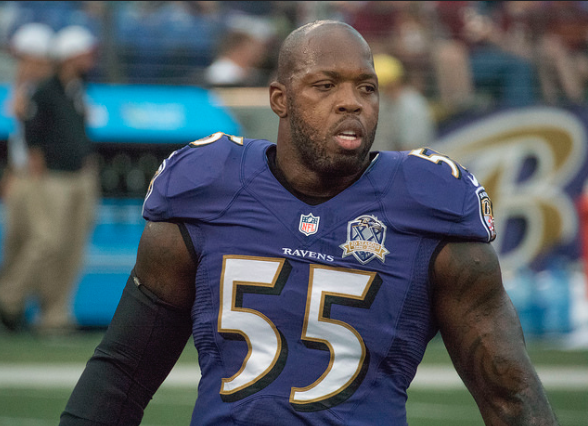 “You can never replace Terrell Suggs,” Dumervil told ESPN.com. Last season, Dumervil and Suggs combined for 29 sacks, which ranked among the league leaders in sacks by any two teammates. The Ravens were hurt by poor execution in their two-minute drill against the Broncos. After Denver capped off a 17-play, 81-yard, 10:56 drive with a field goal, the Ravens got the ball at their 20 with 2:55 left. Baltimore drove the ball into the redzone, but Joe Flacco failed to connect on passes intended for running back Justin Forsett and wide receiver Steve Smith, Sr. On third down, Flacco’s pass was intercepted by the Bronco’s Darian Stewart in the end zone off a deflection. The Ravens defense was able to stifle an inconsistent Peyton Man- ning. Baltimore sacked Manning four times (two by Mosely), held him to just 175 yards passing, and Jimmy Smith returned an interception for a touchdown.